Johannes Neckermann received his first wine education and training from none less than the grand doyen of Burgundy: Charles Piat, who went on to sponsor his initial membership in the Confrérie des Chevaliers du Tastevin. Since, Neckermann has risen to the rank of Officier-Commandeur in the Albany, NY chapter of this esteemed international wine society. 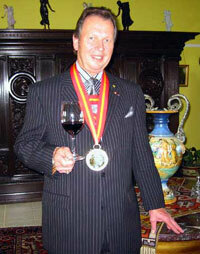 A rival, and no less prestigious wine society, is the Commanderie de Bordeaux, where he is Commandeur. For years he assumed the leadership of the Italian Wine Society: L’Ordine Della Vite, where he has become Curator emeritus. With over four decades of wine experience, organizers of wine functions worldwide to employ Neckermann’s expertise and services. Through 2010, he proudly serves on the Board of the Annual Charity Wine Auction for the HARC held at the Cooperstown Otesaga Hotel, raising six-figure sums for those less-fortunate. In 1991 Neckermann first wrote the column Wine Wise to educate people about the basics of wine appreciation.